Another day and it's time to post another free css template. This one is on the brownish side so I named it Chocolate. I like chocolate so I guess I had to make brown free css template some day. 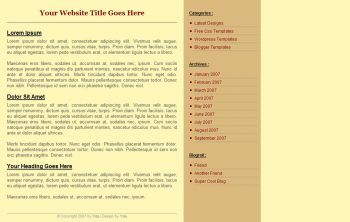 This is 2 column template with nice very visible menu and I guess it is suitable for any website you want. Of course for this free css template to look good you will want to include couple of photos and make some tweaks yourself. Hope you like it and keep an eye on minimalistic design since new templates are coming your way shortly. Be good and have a nice day.